Never say never. All bets are off. Few predicted Brexit, Trump’s victory in the US, the votes in Hungary, Austria, and the rise of the German AfD far-right party. 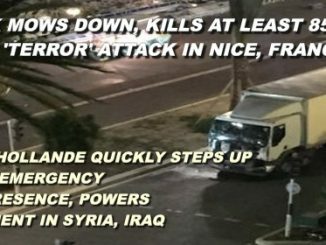 Now something absolutely unexpected is happening in France. A wave of scandals has drastically diminished the chances of the candidates who were widely believed to be the leaders of presidential race. 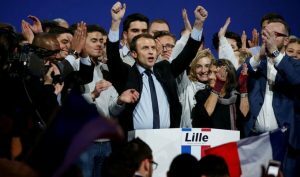 As a result, Emmanuel Macron, a centrist independent candidate, has become the de-facto front-runner in France’s 2017 election. Macron would beat the National Front’s Marine Le Pen in May’s presidential run-off by a margin of 65 percent to 35 percent, according to an Elabe poll for Les Echos and Radio Classique. He would win about 23 percent of votes in the first round of voting, compared with 20 percent for Fillon and 27 percent for Le Pen. The February 1 poll showed Fillon’s score fell by 5-6 points to 19-20 percent for the first round of the presidential election, set for April 23. 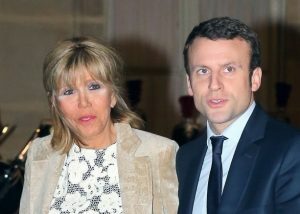 Mr. Macron is a big surprise for race watchers. He has no political experience. He’s never held an elected office before. He does not belong to any of the three leading political parties. As a member of Socialist party for a few years, he did not pay fees and did not participate in the party’s activities. The candidate worked as President François Hollande’s economic adviser to become economy minister in 2014 before resigning last year to lead his new centrist party, called En Marche! Mr. Macron runs as an anti-establishment candidate, but is he really one? Graduated from the prestigious Sciences Po and École Nationale de l’Administration (ENA) and having served at the Ministry of Economy, the candidate appears to be the product of the French elitist and conformist education and political system. And it’s not that only. For some time, Mr. Macron served as rapporteur for the French Commission on Economic Growth (Commission pour la libération de la croissance française), chaired by Jacques Attali. Mr. Attali (pictured below) is a philosopher and a globalist. He is the author of stories about national states disappearing from the Earth as a result of wars. The survivors create a democratic state under the control of a world government. That’s his vision of the future. 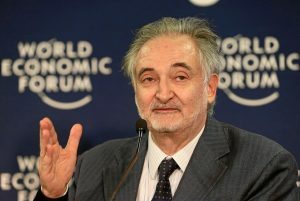 Jacques Attali has had the ear of many presidents from François-Mitterrand to the current President François Hollande. French media calls him the real president of the country. In 2008, Attali submitted his proposals on economic reform to then President Sarkozy. The report was entitled «300 Decisions for Changing France». It called for sweeping liberalization of the economy and cutting labor costs. One of the ways to do it was opening the country for migrant flows to make newcomers work for low wages without the right to create trade unions. The plan also envisaged reduction of expenditure for medical care, education and pensions. Sarkozy was not radical enough to adopt the plan. In 2014, Macron submitted his own report to repeat all the key points of the Attali report. In 2015, the proposals contained in the paper became the Macron law. The «loi Macron» was enforced by presidential decree – the presidential right Francois Hollande had vigorously criticized before his election. Banque. In a four-year-stint he made it from an analyst to an investment banker. His personal income grew immensely. Those years he made connections in the business world to become known under the nickname of «the Mozart of Finance». Today, the key points of his program are the ‘uberisation’ of the economy, the liberalization of specific job sectors, the reform of the school system, and the opening of a wider debate concerning the integration of new technologies in the national economy. In comparison, other candidates are seen as a segment of the established old guard pushing for policies that have failed to deliver strategic successes in the last two decades. His views on major issues are vague. While strongly condemning terrorist acts, he does not call for closing the borders or curbing immigration flows. He stands for boosting national military potential without leaving NATO. He sounds like a disciple of Attali extolling the virtues of European unity. He opposes the Right and the Left in an attempt to get the support of Socialists and those who believe the Le Pen’s National front is too radical. All of a sudden, a youth movement numbering a few thousand emerged to support him. It’s really hard to explain how an unpopular economy minister can get support of young people living in the country with a depressive economy! private life has become his strong point – a real romantic story. All told, a thought comes to mind that there is somebody very influential behind the curtain pulling the strings to push Macron forward. It would be logical for the «Rothschild banker» to become the «Rothschild presidential candidate». Macron has benefited from his personal success and strokes of luck when well-known French politicians failed to make it through primaries like Bordeaux mayor Alain Juppé, or became victims of scandals. He has makings to woo the public – his appearance, the touching love story and political correctness. Everything well thought out and meticulously prepared. It is working. But in the long run, it may turn into a weak point. His image may look fake. His independence may be questioned. True, French influential circles are at a loss looking for seemingly new faces and new ideas to offer. It’s an open secret that bankers do support politicians, but strong national leaders can impose the agenda of their own to make influential sponsors accept it. Macron does not look like the one to stand tall and not kneel when under pressure. His views on foreign policy are extremely vague. But many voters realize how much domestic issues are intertwined with what is happening abroad. There will be debates and interviews, questions asked and problems raised. Until now, nothing proves Macron is prepared to offer anything like a coherent foreign policy and that’s his weak point too. Can he win the most unpredictable French presidential race in recent history? The chances are there, after all he is leading in polls. But so did Hillary Clinton.